Web Design and SEO: Why is Responsive Design the Best for SEO? With web browsing through mobile devices showing a steady upward trend, responsive web design has proven to be the best solution that combines the benefits of desktop and mobile dedicated sites. 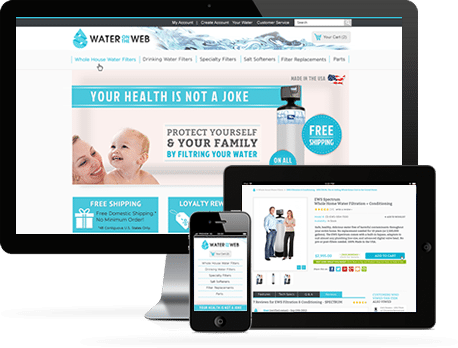 When your website incorporates responsive design elements that means that all the content on it can be displayed to all the users, regardless of whether they are using a mobile device or a desktop computer for viewing it. Furthermore, a responsive site can still tailor the data for easier viewing through mobiles through a few changes in the navigation and the order of showing content. That being said, the benefits of responsive web design do not end here. Responsive design has the upper hand on building separate desktop and mobile dedicated sites when examined from an SEO perspective, too. Let’s see why. Often, the website developed for the mobile platforms has different content from the desktop version of the main website. This can be observed in a few common scenarios. Since the mobile version of the site is almost every time built after the main site, the owners of the site often choose to add to the mobile site only the “important” web pages of the primary site. However, though the “less important” pages that are left out may receive smaller traffic, they have at least some traffic. If you exclude those pages, you will lose the mobile users who would have reached your site by finding those pages through the search engines. If our mobile site features content that is not found on the desktop version, you may face two issues. First, the mobile-only content may take longer to get indexed. Your desktop website is likely to be stronger as compared to the mobile version, thus Googlebot will visit it more often. So, the content that is only available on the mobile version will be a lot harder to find. The other issue you may run into is that your desktop visitors will be deprived of that content. Even if you think that the desktop users won’t be interested in a certain page, do not exclude it from the desktop version; just don’t prioritize it in the site navigation. In the worst case, some pages of your site won’t have any mobile traffic and others won’t have any desktop traffic, but you won’t be losing visitors due to missing content. The mobile visitors have access to less information compared to the desktop viewers. – In that case, it will be harder for your mobile site to rank for the same amount of search terms the desktop version would rank for. It may be tempting to have less content because of the smaller screen, but do not forget that mobile users are used to scrolling and expect it. The desktop visitors receive redundant or superfluous information and the mobile viewers get streamlined content. – In this scenario, the excessive information on the desktop version may be unnecessary anyway and it only creates clutter. Responsive web design can resolve all the above issues as the content added to a responsive website is aimed at all visitors and not mobile or desktop users in particular. The site will have all the pages and the flexible navigation will allow the users to access the data they are interested in most. Thus, the rankings of the website won’t suffer due to missing or unmatching pages in the mobile and desktop versions. In case you use different HTML in the mobile version of your website, you will need to bind the separate versions of every web page together. There are two options for that. In dynamically served mobile sites, the same URLs are used but depending on the user agent that is requesting the pages, the servers will send a different code. However, to the search engines this may appear like “cloaking” – sending different data to mask the real content of your site, and this attracts penalties. To prevent that, you must add a Vary HTTP Header. The URL is a unique ID for the search engines so your content should never be duplicated on two URLs. In case you choose to have a separate URL for the mobile version of the site, you have to select one of the sites as your “original” content source and use the rel=”canonical” tag for the other page, the “copied” one. Usually, you will have a canonical tag placed on the mobile site and it will be pointing to the desktop site. Google’s recommendation is to place a rel=”alternate” tag on the desktop pages too, so that the search engine will know that there is a mobile version of the site as well. In case you do the tagging of the mobile and desktop versions properly, the mobile site will most likely rank equally as well as a responsive site, but the scope for errors with tags and redirects is very big. On the other hand, a responsive site won’t face this issue in the first place as it is the same site you will be serving every time. If you choose to have separate mobile and desktop versions of your website, the tasks of updating, changing and maintaining the two versions will also be separated. In some cases, there are even separate teams dealing with these tasks. Often, the changes to the mobile site are usually made after updating the desktop version, which means that the mobile version may lag behind the desktop one. When adding new pages, that can pose issues with redirects, and when making changes to the content, the mobile visitors will receive inferior content compared to the desktop ones. This makes the job of your mobile team even harder. On the other hand, when you use responsive web design for your site, all the changes and updates made to the site will be enacted onto the mobile and desktop versions simultaneously and instantaneously. This eliminates the need for a separate mobile team and the worries about inconsistencies, wrong redirects and lagging behind in content. A separately designed mobile version of your site may not always be inferior to a responsive site. It may be just as good if it is built really professionally, but that requires a lot of ongoing effort. Also, there are some cases when you might want to have different content on your mobile site and in such instances, a separate mobile site may be a better decision. However, in the majority of cases, responsive web design is a much better strategy for displaying your site on different platforms, as it can save you a lot of time, effort and money and spare you from a host of issues. And as we were able to see, responsive sites have better prospects for ranking well with the search engines. We can safely say that responsive design is your best bet in terms of SEO.